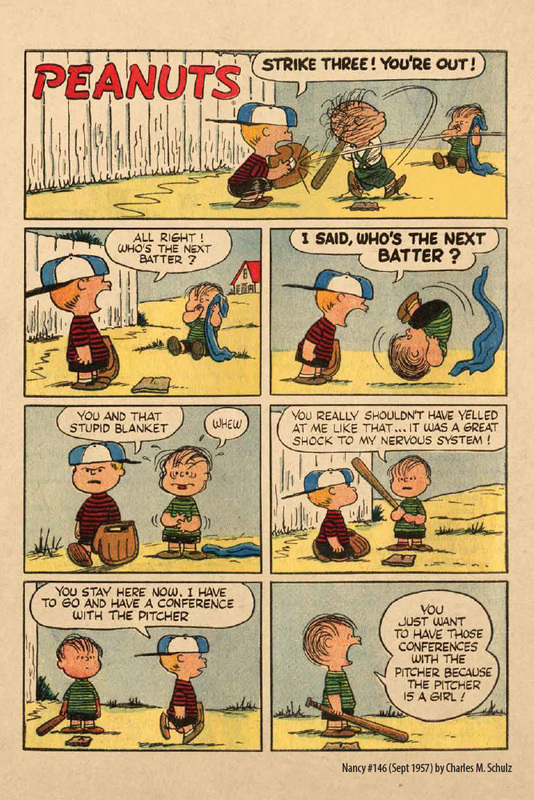 Four-color Peanuts ... back in the day! You've a treat in store, with the arrival of KaBOOM! Studios' Peanuts Dell Archive. It lands today at your favorite comic book store, and will be available next Tuesday (November 6) via brick-and-mortar bookstores, Amazon and other online retailers. The 352-page anthology gathers Peanuts comic book stories published by Dell Comics -- and, briefly, Gold Key -- back in the 1950s and early '60s. 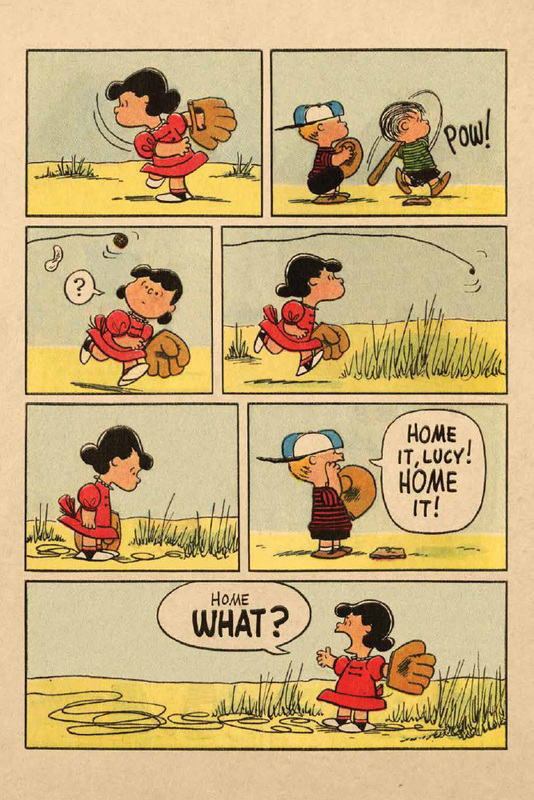 And here's the detail that'll lift eyebrows: Only a small percentage of this material was handled by Charles Schulz. Say what? I hear you cry. Whenever asked, Schulz repeated the statement that fans knew as a mantra: Unlike the case with other "assembly-line" newspaper comic strips, he remained the only person whose hands touched the adventures of Charlie Brown and the gang. Schulz wrote, drew, inked and lettered his strip from its debut on October 2, 1950, until it concluded on February 13, 2000. Similarly, Schulz always promised that the strip would cease production when he finally called it quits. Unlike other classic strips that have been revived, often by lesser talents, Peanuts will forevermore remain solely a Schulz legacy. But that's true only for Peanuts as a newspaper strip. Followers of this blog know that KaBOOM! studios has been publishing new Peanuts comic books and graphic novels for quite some time now, with scripts and art by talented individuals who've delivered entertaining new stories while honoring the tone and spirit of Schulz's work. The same was true back in the day. For the full story, check out this web article. Starting in the spring of 1952, Schulz's Peanuts newspaper strips began being reprinted in United Feature Syndicate comic books such as Tip Top Comics, Tip Topper, Sparkler Comics and United Comics (the latter eventually retitled Fritzi Ritz). UFS got out of the comic book publishing business at the end of 1954, and some of its titles were picked up by St. John in 1955, including Fritzi Ritz and Tip Top. Reprinted Peanuts newspaper strips continued in both. Big changes came in late 1957, when Dell Comics (Western Publishing) took over from St. John. Peanuts continued in Fritzi Ritz and Tip Top, and also became a regular feature in Nancy (later retitled Nancy and Sluggo). The covers promised "All brand-new stories" ... and Dell meant it. No more newspaper strip reprints, and that included the Peanuts supporting features. 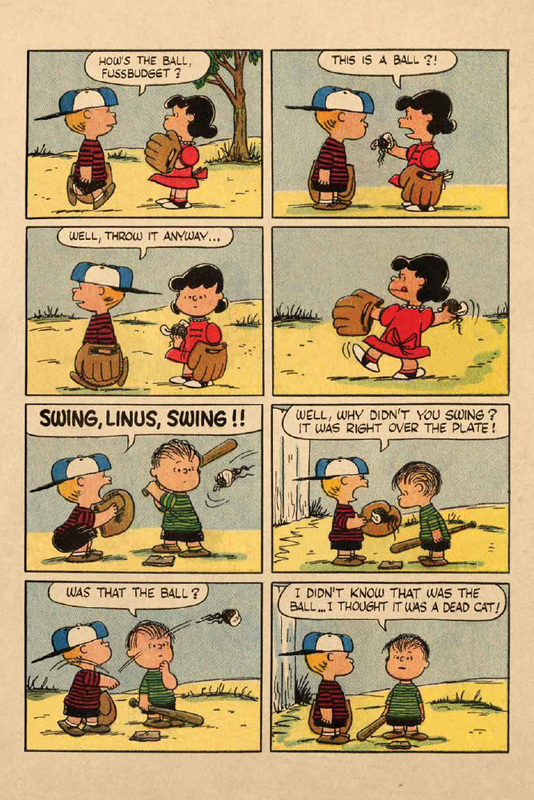 But these four- and even eight-page comic book stories involved a lot of work, at a time when Schulz was incredibly busy; Peanuts was becoming a phenomenon, and he also was poised to debut his other newspaper strip, It's Only a Game. He therefore turned the bulk of the Dell Comics work over to Jim Sasseville and (later) Dale Hale, associates and good friends of his from the Art Instruction School in Minneapolis. They "ghosted" Schulz for several years, although -- here's the best part -- Schulz did handle some of the stories and art himself, as you can see from the four-page story we've included here. 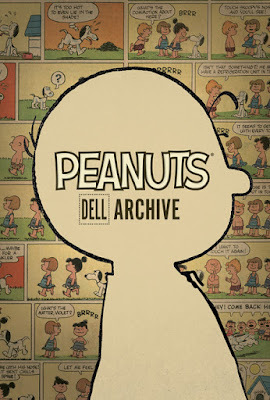 During that time, Dell also granted Peanuts its own title: at first only occasionally, but eventually on a regular basis, as with the other books. 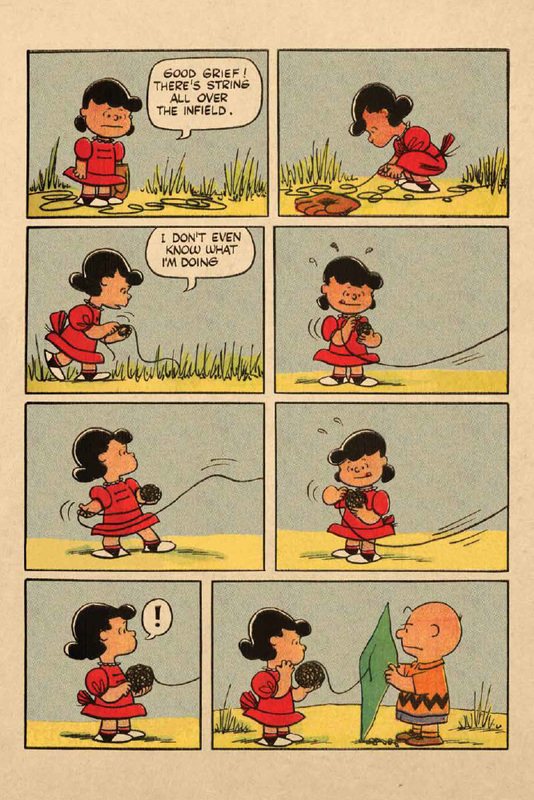 This KaBOOM anthology gathers all the "new" Peanuts content from Nancy/Nancy and Sluggo, Tip Top, and Fritzi Ritz. It's a wealth of material, with each story dated (by source title), and the artist credited (when known). It's fascinating to chart the evolution of story and art over this seven-year span: from its origins as carefully ghosted material pretty much indistinguishable from Schulz's work, to the lesser quality of the final few years. 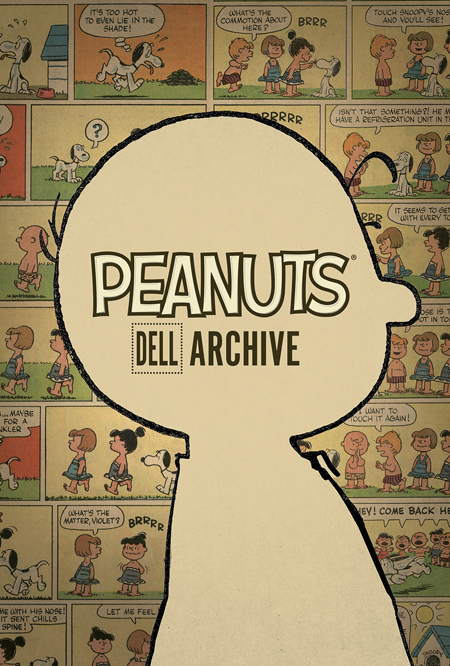 This is roughly half of the Dell content: everything except all the stories that appeared in Peanuts' own comic book. If this initial anthology sells well, we can hope that KaBOOM is encouraged to present the rest in a second volume. So buy two copies, and give one to a friend! Purists probably need to place all this work into the same category as the later television specials: interesting to see, but "not canonical" (which, I suspect, is the way Schulz himself viewed it). So, just as The Little Red-Haired Girl never appeared in the newspaper strip (silhouette notwithstanding) but did turn up in a TV special; and just as television granted Snoopy two additional siblings (Molly and Rover) never mentioned in the newspaper strip; Charlie Brown and his friends had lots of adventures -- some of them quite preposterous! -- in this "alternate universe" of Dell comic books. 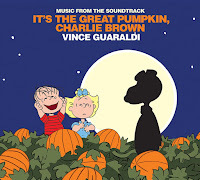 This week, Craft Recordings (a division of Concord Records) is releasing what they are calling a soundtrack album of Vince Guaraldi's music to It's the Great Pumpkin, Charlie Brown. The album will be released on CD on Friday, October 12; it's already available as a digital download from iTunes, Amazon, and other digital music stores, and also available on streaming services such as Spotify. A vinyl (LP) release has also been announced, but currently doesn't have a release date. This might sound like exciting news to many Peanuts fans, given the great music Vince Guaraldi (and John Scott Trotter) composed for the classic television special. Unfortunately, it turns out the album is more trick than treat - it disappoints in content, quality, and length, and in my opinion, is best avoided and not worth adding to your collection. The problems are due to the source used for the album. Unlike the music that appears on other Vince Guaraldi albums - such as A Charlie Brown Christmas and A Boy Named Charlie Brown - the tapes of the original musical recordings for the It's the Great Pumpkin, Charlie Brown special are lost and may well no longer exist. So instead, Craft Recordings has used the "music and effects" track from the special to create this album. Basically, this the exact audio from the television show, just without the dialog. 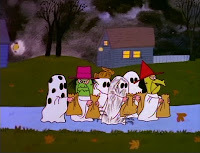 That means while it does have the background music as it appears in the special, the tracks also have all the sound effects - for example, the thuds and bumps of Linus and Lucy rolling the pumpkin and cutting it up in the opening scene, Snoopy blowing on the leaf and the sound of Charlie Brown charging into and landing in the leaf pile in the next scene, and so on. While most of the tracks are affected to some degree, the worst is "Breathless," the music when Snoopy the WWI Flying Ace imagines he's crossing no man's land. This is one of the soundtrack pieces most requested by fans - but on this release, the subtle music is buried under various gunshots, sirens, and other sounds to give the ambiance of World War I. The music and effects track is also at least one, if not several, generations removed from the original music recordings, resulting in a noticeable loss of sound quality. While Craft Recordings' engineers have made some effort to remaster and restore the sound, one cannot create a miracle from a weak source, and the limitations show - there is distinct hiss in some tracks, some harshness, and volume fluctuations. The tracks are also all in mono (not stereo). The final issue is that this new album presents the music exactly as it appears in the special. Typically, when music is recorded for a television special or a movie, the musicians record longer, full pieces that are then edited down to fit the special as needed. On the Charlie Brown Christmas album, we hear the full music pieces, instead of the shortened versions that play in the background of the show. Unfortunately this isn't the case with the Great Pumpkin album, since the original recording session tapes (apparently) no longer exist. Using the music as it was edited for the special results in numerous very short cues (many are just 20-30 seconds long), abrupt fades and transitions, and a general choppy feel to the whole thing; it's not a satisfying listening experience just based on this alone. The intrusive sound effects and overall poor audio quality make it even worse. In fact, the entire album is extremely short: it's only a little over 20 minutes long (as the special itself only runs around 24 minutes). Having to pay full album price for only 20 minutes of music is very poor value. At the very least, Craft Recordings should have combined the album with the release of music from another special. Nowhere in their press release - or on the album cover, front or back - do Craft Recordings make it clear that customers are getting a music and effects track instead of the original recordings. The Great Pumpkin would not be impressed with their sincerity. Given that we all love the music from It's the Great Pumpkin, Charlie Brown, I wish I could give a better report. But this album in no way does that music justice, or provides an enjoyable listen. Releasing it in this form is inexcusable, and Craft Recordings should be ashamed to have done so; it feels like a cash grab on unsuspecting fans. You'd be better off saving your money, and just listening to the audio track of the special itself again. 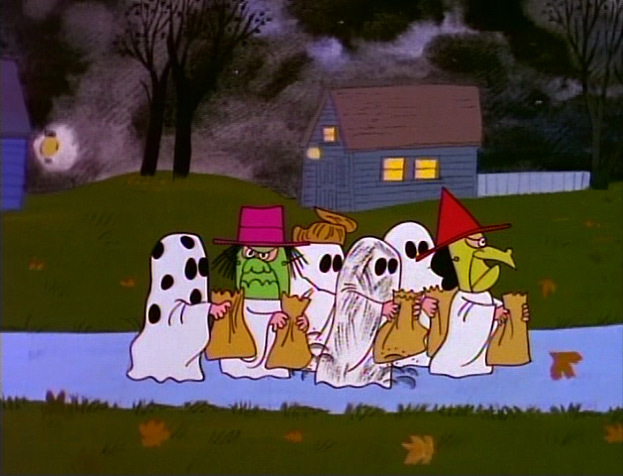 ABC will show It's the Great Pumpkin, Charlie Brown twice in October 2018: first in an edited version on Thursday, October 18 from 8:00 - 8:30 PM, and then the full, unedited special together with You're Not Elected, Charlie Brown on Friday, October 26 from 8:00 - 9:00 PM (all times Eastern/Pacific).